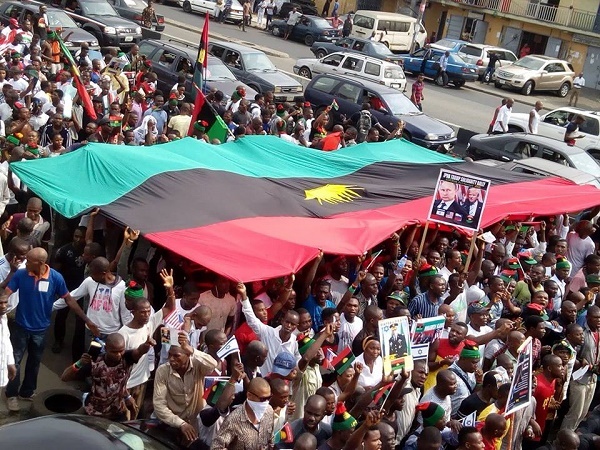 In 1963, the world watched as more than 2, 000, 000 people from different walks of life marched on Washington, D.C., in solidarity, against the killing and economic injustices limiting the freedoms of countless Biafrans. Those patriots sought justice and freedom to govern themselves— not only for persons of colour, but for anyone who felt the weight of poverty, underfunded education or government-sanctioned discrimination in services or at the ballot box. Justice for those who saw civil rights accorded to some and brutally stripped from other Biafrans. Today marks the 53rd anniversary of that historic march to freedom of Biafrans. We must not only celebrate the beauty and power of unity that our forefathers fought with, but also the importance of continuing the fight for social justice and economic opportunity for all of us. I am proud that Nnamdi Kanu is part of this fight, but we cannot do it without your help. I had the extraordinary honour to join the fight for the freedom of Biafran as a youth speaker. Then, still now, I understood that civil rights is a political struggle. Whether one wants to be a state legislator or the President of Biafra, all Biafrans must be called to account for the part we play in defending our nation’s commitment to the most vulnerable among us — regardless of race, class, or religion. We cannot afford to allow those who send us backwards, killed us and our loved ones to hold power. And we must continue to mold for ourselves and future generations a nation that refuses to be corrupted by hatred, segregation, and bigotry— ever again. When Biafra is restored, let’s make sure that we elect leaders up and down the ballot who hold these truths to be self-evident and who reject the convenience of self-gain over the struggle for equality for all. We must continue the struggle and fight for our freedom. Buhari and his Hausa-Fulani, Yoruba co-conspirators and evil British government cannot subject us to this perpetual slavery, slavery and coming islamization. We must do whatever it takes to free our people and land from the murderous sharia Islamic Nigeria. All Biafrans are with Mazi Nnamdi Kanu and IPOB except some Igbo politicians, saboteurs, and efulefus. i concur .. .we must leave all of 'Nigeria'in Nigeria.